Well, the cucumbers are in, for better or for worse. I (and no doubt they) would prefer the temperature to be about 10 degrees warmer, but... I really want the cucumbers to be well established before we go away on holiday. We are going to be away for 12 days, and I don't think the cucumber plants would have been happy to sit in their little pots until the the end of June. My plan is to have two sets of three cucumber plants - one each of "Iznik" and "Melen" - growing up teepees in the big Woodblocx raised bed. I planted three cucumbers a few days ago, putting them under my biggest bell cloches, but since I only have three of those, the plants that have gone in today will have to manage without. No more of this namby-pamby "I'm spending the night indoors" malarky! Those plastic bell cloches have been extremely useful, especially this Spring with the conditions being so cold. I have had them for a couple of years now, and I remember that they only cost me £9.99 for the set of 3, which I think is good value. I have kept an eye open for more of them, but I haven't seen any. Stewarts make some that are a similar size, but they are made of much thicker material and they cost a lot - £12.99 each I believe, and I'm not prepared to spend that sort of money. The raised bed is beginning to fill up now. You can see that the "Maskotka" tomato plants are putting on weight. Although I had not originally intended to do so I decided in the end to stake them, because they got blown about very badly in the gale-force winds we had the other day. In a few days I will put in the poles for the cucumbers to climb. I may see if I can muster enough natural wood poles, which look much more attractive than plain old bamboo - and the cucumbers will be able to grip them better too. At some stage I'm going to have to remove the netting over this bed, but not until those plants have got a bit bigger and are able to survive the nightly snufflings of the local badgers and foxes. Well, in my opinion, everything looks better in the sunshine! Here in NE Hants we have been really lucky with Bank Holiday weekend weather so far this year. The May Day holiday weekend was perfect, and this past weekend (the Late Spring Bank Holiday) has been great too. How did that happen? Normally Bank Holidays are cold, wet and windy. Just to prove my point, I'm posting today some photos taken that weekend, of plants with sunshine on them. Here in the UK Monday was a public holiday - we call such things Bank Holidays - so we had a long weekend, and (wonder of wonders) we had a couple of decent days' weather too. I spent a fair bit of time gardening (no surprise there then). 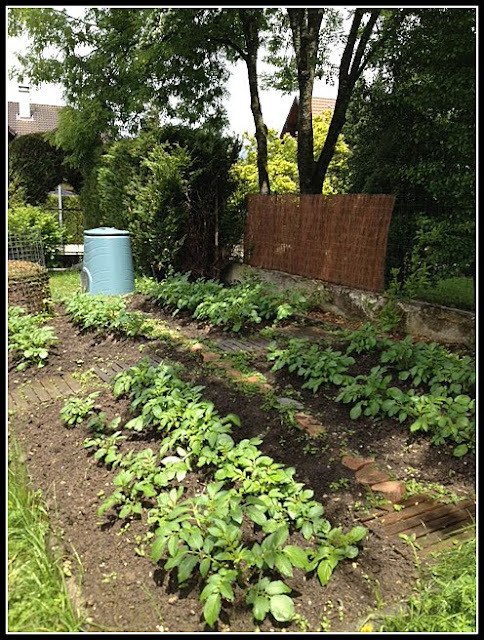 The first task was to evict the potatoes from the plastic coldframe where they have been taking it easy all this while. They joined their colleagues al fresco. I then transplanted 9 of the chillis from their 5" pots into big 10" pots, and put them in the plastic coldframe. Hopefully this will provide enough protection to allow them to survive the cold nights. Right now they are looking extremely promising, and I really don't want to lose them, but I am hedging my bets and keeping the rest of the plants in small pots and I shall continue bringing them indoors at night until I'm convinced that the "main crop" ones are OK with being outside permanently. Having taken care of the chillis I then turned my attention to beans. I planted out 14 Runner Beans (10 "Scarlet Empire" and 4 "Firestorm"), placing them at the feet of those canes I erected the previous weekend. I plant my beans fairly deep, with the level of the soil just below the first set of leaves. This gives them good stability, and puts their roots deep down into the soil where they will find maximum moisture. As with the chillis, I have some spare beans, which are spending their nights inside a plastic mini-greenhouse, just in case... I have not yet planted the Climbing French Beans, because they are more tender than the Runners, so I'm leaving it as long as possible. By next weekend I think they will be too big to remain in their pots, so they will be planted then, come what may! Notice the rows of Radishes in between the beans. I'm not sure if they will get enough light, but it's worth a try, because Radish seed is very cheap. In the Spring and Summer almost every gardening magazine you see comes with a free pack of Radish seeds! All plants need a certain amount of light and water in order to live. Generally though, most of them prefer a little rainfall and a lot of sunshine. Because of this there are a lot of disappointed plants around at present! There are a couple of exceptions to the rule however, such as potatoes. I grow all my potatoes in pots and containers of some sort, which can dry out rapidly. I often have to water them every day at this time of year. But not this year. They are loving the cool, wet conditions. It's early days yet, and since these are a Main Crop variety I know I have a long time to wait. Unfortunately, it seems highly likely that we are going to get another cold wet Summer, so I wouldn't be surprised to find Blight being a big problem this year. I often have difficulty producing good Radishes, because they don't like my dry sandy soil, and bolt at the slightest excuse, but this year they are doing much better than usual. Last year we had much more rainfall that normal, but one crop particularly thrived on the wet conditions - Runner Beans. I had my best year ever for Runners. They produced a huge crop. So you have to think positive. I always grow Runner Beans anyway, so even if we get wetter conditions than most plants would like I'll still get a good harvest of something. P.S. Remember my daughter Fiona's potato-patch in Ornex, France, that I helped to prepare? She's a real "Chip off the old block", that girl! My harvests this past week have been of the same veg as the week before - Asparagus, Radishes and Baby Leaf Salad. The Broad Beans or Peas will be next, but they are both still a long way off. So for the time being then you have to look at more photos of the same things! I have harvested 11 more spears of Asparagus. It's not very many, I admit, but there is more to come, and it is just SO satisfying to be able to eat Asparagus you have grown yourself. I haven't counted the Radishes, nor weighed them. I just know we have eaten several batches. We usually eat Radishes as a pre-dinner nibble, served with a little bowl of salt to dip them in. There is plenty of lush green salad for us to eat now. The Rocket in it is aptly named - it grows very rapidly indeed. I'm picking individual leaves from my Lettuces too, because I know thay will mature while we are away on holiday (less than 3 weeks away now!) and therefore we will miss being able to eat them at the fully mature stage. I'm sure that some of my blogging friends will have harvested something more ambitious than this, so why not pop over to Daphne's Dandelions and see what's on Harvest Monday this week? This recipe is my own one, but it is inspired by one invented by Theo Randall, seen recently on TV in the programme called "The Chef's Protégé" where each of three well known Michelin-starred chefs has to select a young chef to be their protégé. My soup is intended to deliver not only some amazing flavours, but also a variety of different textures all in the same dish. It has a velvetty-smooth Butternut Squash base, augmented by yellow lentils cooked so that they have not fallen completely, but still have a degree of "bite". These are topped with earthy, dark- coloured Portabella mushrooms fried in butter to concentrate their flavour, then a thick slice of milky Mozzarella cheese and a crisp rasher of streaky bacon to add a topping with a complete contrast of textures. For a final splash of colour the whole dish is sprinkled with finely chopped flat-leaf parsley. To get the depth of flavour I wanted in the soup I rubbed the squash with some olive oil and a few twists of freshly ground black pepper and then roasted it until it began to blacken at the edges. I also did an onion at the same time, leaving the skin on so that the inside would be protected and go beautifully soft without getting charred. When these veg were cooked (about 40 mins at 160C) I scooped the butternut flesh off the skins, removed the outer skin of the onion and and zuzzed them in the blender for a couple of minutes with a little warm chicken stock and a tiny bit of grated nutmeg. The resulting puree was very smooth and vividly orange in colour. While the squash was roasting I cooked the lentils. 10 minutes' hard boiling then about an hour slow simmering until tender. These were yellow lentils, otherwise known as Toor dhal. When they were cooked I drained off most of the liquid and put them to one side for later. This really was an incredibly easy dish to do. Shortly before dinner-time I gently warmed the butternut puree and the lentils, adding a bit of chicken stock to each loosen their texture. While this was happening I fried the mushrooms and grilled the bacon, and prepared a couple of nice thick slices of Mozzarella. Earlier in the day I had made some bread too, so I got some of that ready also. Isn't it true that at certain times of the year flowers with a certain colour predominate? Here in the UK Spring is characterised by yellow flowers - daffodils, primroses, Forsythia, Gorse, whereas early Summer is all about blues and purples. Our neighbourhood is currently full of clematis, lilac, wisteria and bluebells. My garden is having a purple patch. I have Chive flowers that are just opening. The little green seedling at the top of the photo is a self-seeded Winter Savory, so I shall let that get a bit bigger and then transplant it. 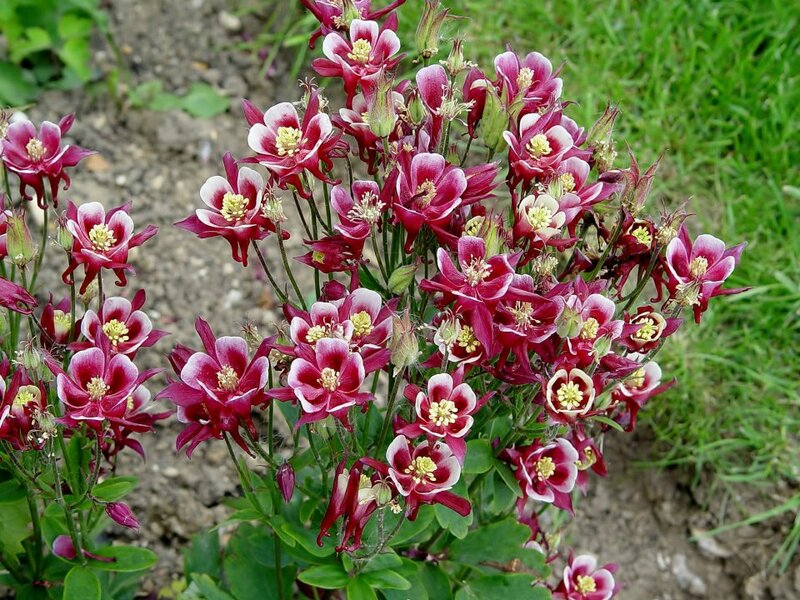 Aquilegias are also in fashion, which is nice because I am currently having a bit of a craze on them. These are leaves of Aquilegias grown from seeds sent to me by my blogging friend David Ford. In the absence of an official name for them I have called them after him. This is another Aquilegia, one which has been in my garden for years. It may not be new and exciting, but I love it. The very young leaves are quite red, and almost transparent, but as they mature they go a deep purple colour. Unfortunately the beetroot which might have added a veggie note to this purple post are a long way off being ready. Cucumbers. Dare I plant them out?